This is an attempt by ‘Petersen’s Hunting’, a hunting publication based under Intermedia Outdoors, to create the ultimate, most versatile survival firearm possible. 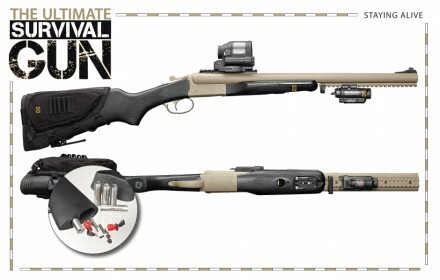 They started with a Stoeger’s Double Defense as a base, then added modifications which include: drilled holes in the stock to accommodate spare gun parts, accessories, and chamber inserts for the use of multiple shotshells and calibers of amunition, inserting a compass into the stock, a fire steel inlaid into the forearm, a micro tool held in the forend with a magnet, replacement iron sights, a laser/light combo, red dot sight, and stock mounted cartridge sling and cheek pad/pouch. Petersen’s Hunting – Is This The Ultimate Survival Gun? This entry was posted on Friday, November 16th, 2012 at 13:01	and is filed under Gun Pr0n, Media. You can follow any responses to this entry through the RSS 2.0 feed. Both comments and pings are currently closed. Not to nitpick, but this looks a lot like a gun that willow haven outdoor did about a year ago. But I think his was a mossberg 500 pump. Cool Project though.